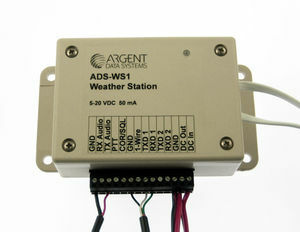 The ADS-WS1 is a low-cost weather station with direct APRS support (no external TNC required), serial data output (for connection to a PC or TNC), and voice synthesis capability. Firmware for the WS1 is still in beta testing. Information provided here is preliminary and subject to change. Voice samples have been uploaded as of 5/4/2010. Most beta test units shipped without voice data loaded - voice.bin will need to be loaded through WxConfig for the voice function to work. 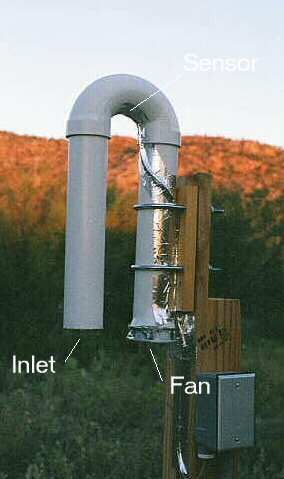 The main unit is housed in a flange mount enclosure with a removable 14-position 0.15" pitch terminal block, a 0.5" port (covered with stainless steel mesh) for sensor ventilation, and notches to accommodate the wind and rain sensor cables, connected internally. To open the main unit's lid and install the wind and rain cables or set DIP switch settings, unscrew the four screws on the top of the housing. Temperature, humidity, and barometric pressure sensors are contained within the main unit. Currently port 1 outputs serial data at 2400 baud in Peet Bros data logger format. Complete record format is available, but only by sending a >H to the unit. Weather Display (http://www.weather-display.com/index.php) will work with the WS1. Weather Display Lite free version will also work with WS1 - use Peet Ultimeter as weather station type. You need a "real" RS-232 cable. TTL level will not work. This section is a stub. See the OpenTracker+ manual for a description of the radio interface signals and jumper settings. The LED blinks once every two seconds to indicate normal operation. A green blink means the real-time clock is set, and a red blink means it's not. The LED will light solid red when transmitting. The WS1's internal clock is set when the configuration program exits. Early board revisions did not have provisions for backup power, so if power is lost the clock resets. Boards equipped with battery connector J3 can be connected to a 3.6v lithium battery to provide backup power to the clock. 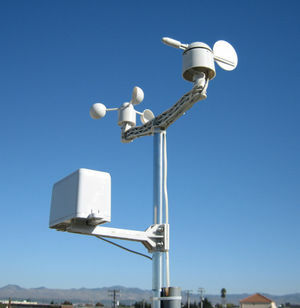 The wind and rain sensor assembly includes a 2-piece steel mast, cup anemometer, wind vane, rain gauge (0.011" resolution), cables, mounting arms, screws, cable ties, and clamps. Avoid overhead power lines. Ensure the mast is properly grounded, and don't install the assembly on a chimney where it might be exposed to smoke and hot gasses. When aligning the wind vane/anemometer, the 'boom' runs in an east/west direction with the anemometer on the west. The ADS-WS1 base unit must be installed in a sheltered location. If no suitable location is available, you can build an enclosure to protect the electronics from rain and direct sun while still allowing the temperature and relative humidity sensors to work properly. Some links to do-it-yourself Stevenson screen and Gill shield projects are included below. There is a discussion group ADS-WS1 Group On Yahoo Groups. If you are having trouble you can ask question and read through what others are doing. Datasheets and other interesting documentation are also with the Yahoo group. weather.sh was developed as a quick and simple way to view the data from the Argent Data Systems ADS-WS1 Weather Instruments. The objective was to NOT have to purchase a physical Display unit nor have to pay for any fancy software for Linux or Windows. This software provides nearly instant satisfaction that your weather instruments are working -AND- it can be used as your weather display just as it is! Leave it running in an Xterm, buried in a corner of your screen, or leave it minimized and pull it up when you wish to see the weather. Very simple! When first started, several fields in the display are filled with zeros and will be replaced with real values as the script runs over the course of the first day. Each night at 1 minute before midnight, some statistics (Hi/Lo temps, Peak wind, Daily and Long-term rainfall) are written out to a log file (weather.log). See http://server1.nuge.com/~weather for further information, and to download the Bash shell script. Completely FREE and licensed under the GPL. So if you modify it, *please* contribute your work back to us for possible inclusion in future releases. 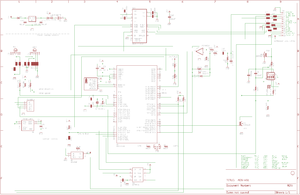 You will need a level converter to bring the RS-232 to TTL levels. You will probably need a 10k resistor from the RXD1 terminal to your supply voltage. The resistor must be disconnected when using the config application. Solar-powered station on the roof of the Argent Data Systems office. This page was last modified on 20 January 2017, at 04:53. This page has been accessed 100,638 times.